Added on November 29, 2012 by admin. “It’s the ‘end of enchantment’” another poem declares, winking and deadpan both. So much is folded into these poems without seeming overrun or cluttered. 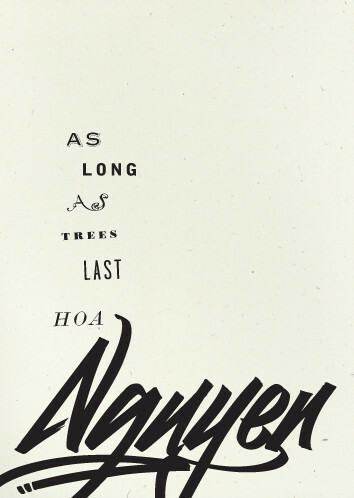 As Long As Trees Last deceptively resists paraphrase, where individual words, seemingly so small in one poem, bloom and stretch, transport and transform between the book’s covers. In 70 pages the book is one unbroken sequence and can be read over the span of a bus ride—but the initial joy of Nguyen’s wordplay and the complex repetition of terms only benefit from repeated reading and re-visitation. Fruits are poisonous to humans if eaten in quantity. However…these toxins are not harmful to birds, who gorge themselves on the fruit, eventually reaching a “drunken” state…Some birds are able to eat the fruit, spreading the seeds in their droppings. The word is slow and rigid in its pace. As when the rabbit and the tortoise race. To meet a dying rabbit on the road. Then, step by step, the words become their own. The turtle creeps ahead to win the prize.